Trailer Strength is the first aspect of “Good” trailer design. Adequate strength allows them to carry loads over less than perfect roads. This is especially important for utility trailers because they are often overloaded or loaded unevenly. They are for utility — for a million uses — and serve in numerous environments, for years, no matter what the requirement. This page of the article is about factors relating to strength along with ways of evaluating them. The maximum load, or the capacity determines much about the strength. It also determine how strong the trailer should be. If a trailer is designed for a capacity of 1000 pounds (short-hand, 1000#) it will obviously be of lighter construction than one designed for 6000#, but they should perform equally well at their rated capacity. Judge trailer strength with respect to its intended capacity. Construction is a big factor in strength. If the trailer frame is bolted together, joints will act differently than if it is welded. Look for gusseting, triangulation, and other such techniques to indicate solid construction. Look for things that indicate the trailer design is well thought through. This will give reason to believe there is strength and care in the design. In general, we recommend staying away from bolt together trailers. This does not say bolts are inherently inferior. We have just seen too many poor bolting applications. In some areas bolts are desirable — especially for options, and when things are removable or adjustable. So, with bolts, look for methods of security like lock nuts, keys, tabs, etc. which keep the bolts from vibrating loose. The real problem comes when the trailer “feels” strong (because steel is stronger than your hands), but the dynamics of a large load will make it flex. Look at welded joints and be comfortable that welds are sufficient. Like many of these suggestions, this is subjective. Small short welds can indicate short-cuts or weakness or cheapness. Examine bolted joints for size, number and separation of bolts, then see that the members will support the bolt loading. Thin or weak members (such as bolts through tubes) will crush by tightening bolts. Also look for lock nuts or other retainers to keep things tight. Look for gussets. (See the image.) Gussets offer strength and rigidity to the frame. Also read this article on strengthening a trailer frame if you’re into the DIY of making changes yourself. Keep in mind the trailer use too. A light trailer requires less than something heavy — like a dump trailer. Evaluate reinforcement in areas where the axles mount. Since these points of attachment are high stress areas, reinforcement or double layers of material are always good to see. Torsion axles add a lot of extra stress on the frame at the attachment point. (Load is both vertical and torsional.) It’s OK, as long as the trailer builder accommodates the added loads. However, if the frame is not reinforced where a torsion axle mounts, it’s a sure sign of weakness. Please see this article for an FEA comparison showing axle types and the resulting stresses on the frame. For existing trailers, a quick test of construction is to hook it up to the tow vehicle, then jump up and down on each corner. The trailer should move up and down with you, but the trailer frame should not twist noticeably. If twisting is noticeable, the design is likely weak. See that materials and construction techniques are adequate. (Each design is different and it is hard to give a visual judgment, but think about the size and relative strength of the materials, then make a judgment for the effect on trailer strength.) It is always a trade-off for strength versus weight, so give it the good “gut feel.” Most trailers will indeed carry the specified load, however, if the weight is not distributed well, it can seriously damage the trailer and/or the towing vehicle. Examine load carrying members like the main beams. See that their size and thickness (relative to the load capacity) will handle the things you wish to carry. Flooring materials and spacing between flooring support members is important. This is an area often overlooked, but very important. If you haul an even distribution of boxes, the floor needs less strength, than if your primary use is motorcycles, a tractor or something else where the weight concentrates at just a few points. The even distribution of weight lessens the required floor strength as compared to point loading. Be sure there are enough and strong enough cross members under the flooring to support the expected loads. Examine the frame main beams and cross members for rust. Excessive rust will reduce capacity. This is also an indication of a lack of care or shortcuts in finishing after construction. Aluminum is popular for light weight trailers. It has an expensive feel and a nice allure, so aluminum is a popular material for lots of really nice trailers. However, because of the properties of aluminum, give special consideration with construction and with care for proper trailer strength. Aluminum is more prone to propagating cracks, so when injured (damaged), extra care must be given. It is also more prone to fatigue — and life as a trailer can be stressful — so the design must be right. Aluminum is very beautiful without finish, and it is often in use without finish. This makes it more susceptible to corrosion from road salts, etc.. Be aware! When judging a trailer visually, note that aluminum is not as stiff as steel, so the beams of an aluminum trailer frame must be larger than beams of steel for an equivalent capacity. Another consideration is flexibility. Aluminum has a modulus of elasticity significantly lower than steel. This means that for the same loading, an equal aluminum beam will bend more, even if it is high strength aluminum. Trailer strength includes flexibility. Aluminum is quite a bit more expensive than steel. And, because it is not as strong (stiff), aluminum trailers use more (volume). The increase in volume compensates, in part because aluminum is 1/3 the mass (by volume) than steel, so the overall trailer is lighter. The nice thing, because it is more expensive building with aluminum, trailers are usually built well. Finally, aluminum is not as durable and does not take abuse as well as steel. Choose the right material for the purpose. Aluminum can make a very nice trailer. For the right application it is wonderful, but choose carefully. In context of a utility trailer, it may not be the best choice just because of how utility trailers are typically used. This note is not to discourage aluminum, it is a reminder that it’s not just about weight. Look at aluminum for trailers with a little different perspective. A short tongue indicates weakness. Length of the Tongue. The trailer tongue should be long enough to allow a reasonable turning radius, and clearance to the vehicle when backing. If the tongue is short, it may be an indication of weakness or shortcuts in the design. Short tongues affect both driveability and stability, including back up, turning radius and jack-knife susceptibility. A longer tongue is also nice for extending axle separation (distance from the tow vehicle rear axle to the trailer front axle) for stability and bounce. Axle Location. The axle is behind the load center for stability. Often trailers have the axle at or just barely behind the center of the bed — assuming (I guess) that the load will be heaviest at the front. This is short sighted with respect to versatility, but it is also an indication of weakness. For most applications, the axle is noticeably behind the center of the bed. It is always best to calculate axle position for perfect placement. For maximum versatility allow axle position adjustability. Strong Rear Member. The back most “bumper” of the trailer should be strong. Usually loading and unloading occurs over this member, so it is disproportionately larger (stronger) than other cross members. This is also the bumper, so if there is ever a wreck, it is strong enough to protect against intrusion on the load. Also, make sure it is attached to the main trailer frame members securely. Ball receiver and hitch match the trailer capacity. Each has a capacity marked on it. That load capacity should be at least 15% of the total trailer capability, and preferably much more. The ball receiver fits a ball of adequate size. In general, a ball of at least 1 7/8″ for trailers of 2000# capacity; a ball of at least 2″ for trailers of 3500# capacity; and larger sizes for trailers of 6000# load and up. A little big is not a bad thing. Note: Be sure the trailer hitch on the vehicle is the same or greater, too. Trailer axle(s) match the load capacity. Usually this is not a problem because the capacity of the trailer is a function of the capacity of the axle(s). Just make sure it is. Note 1: For multi-axle trailers, the capacity is NOT the sum of the axle ratings because they do not share the load perfectly. In operation, axle load sharing will be close, but not exact, but it depends largely on the mounting configuration. Note 2: We do NOT recommend torsion axles for use in Tandem or Triple because they do not load share. When you drive over a bump or through a dip in the road, one axle is disproportionately loaded. This can pop tires or damage equipment. Axle springs match the trailer. Again, this is not usually a problem. However, with leaf springs, longer springs are generally indications of a better design. Longer springs help with the ride and load distribution on the frame. With used trailers, watch out for old automotive springs kludged in. Wheels and Tires are key to trailer strength on several levels. They are also worth a bit of a separate discussion to cover all the points. Tires are key on several levels. Tire problems have haunted many a trailer owner, so watch what’s happening with them. Tire ratings MUST exceed trailer capacity. It is not necessary to use trailer specific wheels and tires, but load rating is appropriate. Often automotive tires will give a wider range of options, a better ride, and track better. Make sure load ratings are sufficient. Interestingly, I’ve had several comments on these statements about wheels and tires. Yes, trailer manufacturers want you to use trailer specific tires; and Yes, they do have some advantages in load capacity for the size. Yes, narrower profile tires (like trailer tires) do wear better when not aligned properly. Finally, Yes, trailer specific tires are also better at resisting damage, neglect and abuse (because they are really tough). So, if you neglect your tires, by all means, use trailer specific wheels and tires. 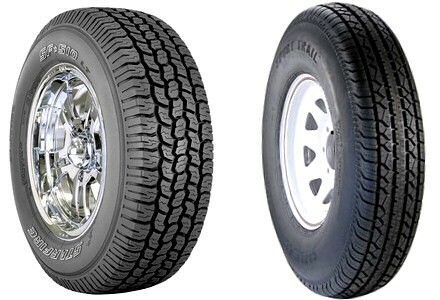 On the other hand, automotive and light truck (LT) tires typically have a better ride (for the capacity), and they’re available in more sizes and styles. Perhaps most importantly, trailer tires are not as available when you desperately need one, (get a flat out in the boonies?) nor do they interchange with tires on your tow vehicle. I personally try to match wheels and tires to the tow vehicle so a spare can work both places. Then there’s the discussion of Radial vs. Bias Ply. I’ll let you research that. One big error … People sometimes claim trailer tires handle dynamic loads better … not so. If anything, automotive tires — which are designed for high, simultaneous, steering, breaking and weight shift loads (think right front tire in a hard left turn while braking) — handle dynamics better. Trailer tires won’t, and rightfully so, because trailers don’t see extremes of dynamic loading and weight transfer like automotive tires. Remember, this discussion assumes similar load capacity — and intelligence with respect to neglect and abuse. Wheels (rims) must meet or exceed trailer load capacity. For wheels, the easiest indication is the number of lugs, but this is not a hard and fast rule. 1000# and 2000# axles usually have 4 lugs; 3500# axles usually have 5 or 6 lugs; and 6000# + axles have 6 or 8 lugs in a larger bolt pattern (or BCD, Bolt Circle Diameter). It is not necessary to use “trailer” specific wheels as long as the load rating and size match. Use trailer specific wheels with trailer specific tires because of mounting width concerns. Use automotive wheels with automotive tires. For more on wheels and tires, read this post from Mechanical Elements. The use of trailer brakes is largely dependent on the tow vehicle and the trailer loading. Oh, and applicable laws. State or Province regulations apply. In general, if your tow vehicle is large with respect to the trailer and expected load, then trailer brakes are less important. If you have questions, it is generally better to fail to the conservative side and install brakes. When choosing brakes, there are several things to consider. First, how will the trailer be used, and what vehicle will be towing it? Electric brakes usually require additional equipment mounted on the tow vehicle. Check local regulations about surge-type brakes. 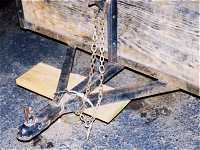 Some areas have threatened bans on such brakes. In general, I don’t recommend surge brakes except as a secondary or emergency measure. Most importantly, are the sides part of the strength of the trailer frame? (See above.) If so, are they also adequate for carrying side loads at the same time they are carrying vertical loads? Again, a thorough evaluation is probably not necessary, but a good “gut feel” is. If sides get damaged (bent or deformed) will it compromise overall trailer strength? Are the sides adequate (tall enough, strong enough, etc.) for the job you require for the trailer? Do the sides shake, rattle, or feel loose? Will that effect the way you want to use them? Examine the attachment. Is the connection solid to the trailer frame? If a load pushes against the side, will it deflect out? (Or in?) Will deflection of the sides also twist the frame members? Look at the supports and spacing between them. If you carry a load that presses against the sides, be sure they are adequately strong. Examine how the sides attach to the tailgate (if present). Be sure that a load against one of the sides will not impact the ability to open or close or latch the tailgate. Appropriate trailer strength, especially for a utility trailer is very important. There are many things to look for as clues in all areas that indicate “cheapness” in the design. Primary methods of evaluation include judgment with respect to the specified load rating, and evaluation of trailer parts with an eye to expected use. Looking for shortcuts in trailer frame design (and other places), then using a good “gut feel” is a valid and valuable method of evaluation. It should have strength sufficient for it’s need. It does not have to be heavy duty if it’s a light trailer. A strong trailer that meets your needs, certainly increases the pleasure of ownership. Do you need trailer plans designed for strength? Check out the plans at MechanicalElements.com for both light duty and heavy duty trailers. Next Up: Dynamic Stability – What makes some trailers stable?